This spacious four bedroom villa with a good-sized pool deck with a very good amount of privacy and a well-equipped games room sits on the Hampton Lakes community, on the US27. The Disney theme parks are a twenty minute drive away. King-size bed, walk-in closet, ceiling fan, TV. En-suite bathroom contains shower over bath, double sink, WC. Queen-size bed, slide closet, TV. En-suite bathroom contains shower over bath, sink, WC. Situated on the US27 in Davenport, midway between the US192 and I-4 is this four bedroom villa sitting on the stunning Hampton Lakes community. The location of this villa is perfect for visiting all of Orlando's main attractions, especially the Disney theme parks which are just a twenty minute drive away. Living Accommodation - The formal lounge is near the front of the villa to the left hand side and has a sofa and loveseat. Adjacent is the formal dining area with seating for six people. Continuing through the villa is the bright, open-plan kitchen with a kitchen table seating four people. Adjacent to the kitchen is the main family lounge with a large "L" shaped sofa, patio doors to the pool deck and a flatscreen TV. Bedrooms - The Master bedroom is to the right of the family lounge and has a King-size bed and an en-suite bathroom. Bedroom 2 is just inside the front door to the left hand side and has a Queen-size bed and an en-suite bathroom. Bedroom 3 is to the right of the formal dining area and has twin beds. Bedroom 4 is next to bedroom 3 and also has twin beds. Outdoor Living - The pool deck has a very good amount of privacy, a good-sized pool, plenty of patio space to relax in the Florida sun, and an outdoor dining table with an umbrella with seating for four people. Entertainment - The games room is equipped with a pool table, fitness machine, table football, a TV, a sofa and two loveseats. Perfect for the whole family to relax and enjoy quality time spent together. Hampton Lakes, completed in 2004, is a gorgeous and well-kept community of almost 450 homes ranging in size from 3 to 7 bedrooms. Community facilities here include lakes, floodlit tennis courts and a couple of children’s play areas. 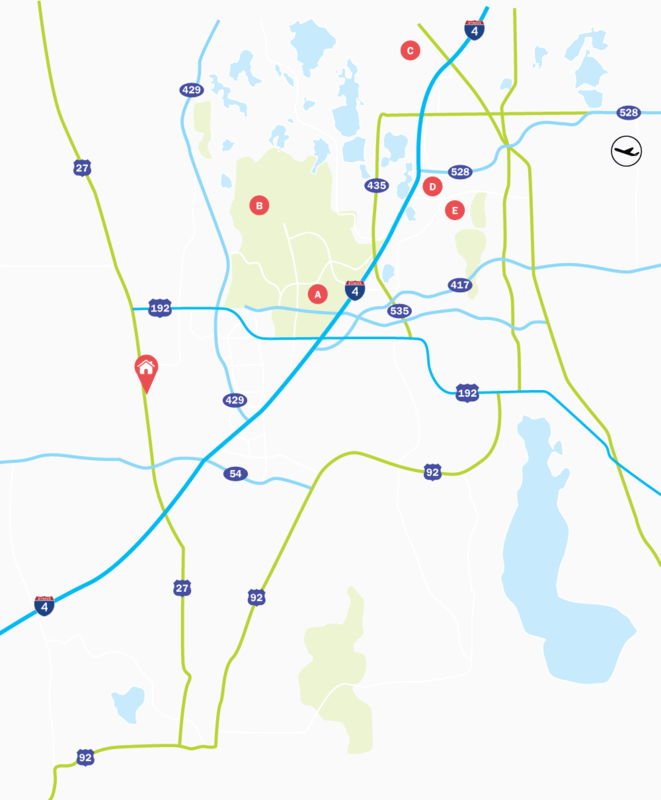 Sitting on the US27, between the US192 and I-4 highway, shops, restaurants and golf courses are all just within a short drive. PLEASE NOTE; this community has a minimum 4 night stay on bookings.